Wetdeck slamming is one of the principal hydrodynamic loads acting on catamarans. 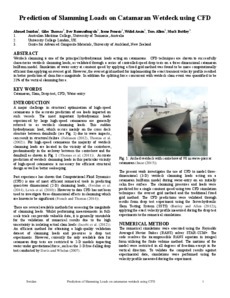 CFD techniques are shown to successfully characterise wetdeck slamming loads, as validated through a series of controlled-speed drop tests on a three-dimensional catamaran hullform model. Simulation of water entry at constant speed by applying a fixed grid method was found to be more computationally efficient than applying an overset grid. However, the overset grid method for implementing the exact transient velocity profile resulted in better prediction of slam force magnitude. In addition the splitting force concurrent with wetdeck slam event was quantified to be 21% of the vertical slamming force.